There are more than 8000 children and youth in care in Alberta. While research on the impact of mentoring for this population is at an early stage, studies have shown that healthy relationships created through formal mentoring programs can positively impact social, emotional, and academic functioning for children and youth in care. The Children and Youth in Care and Mentoring Project enlisted the time and efforts of various organizations to develop tools and knowledge to support agencies providing mentoring programming to children and youth in care. As part of the Children and Youth in Care and Mentoring Project, there were plans to develop a toolkit to ensure the learnings were accessible. 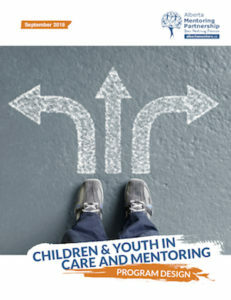 At the same time the Ontario Mentoring Coalition had just completed the development of a Toolkit on Effective Mentoring for Youth Facing Barriers to Success, which included a section on Children and Youth in Care. The Alberta Mentoring Partnership and the Ontario Mentoring Coalition collaborated with the support of Alberta Human Services and the Ontario Ministry of Children and Youth Services, to create a toolkit outlining strategies and practices for mentoring children and youth in care. The Toolkit on Effective Mentoring for Youth Facing Barriers to Success provides further information on developing, implementing, evaluating and sustaining mentoring initiatives for youth facing multiple barriers to success. In 2014, the Children and Youth in Care and Mentoring Project was established when funding from Alberta Human Services was provided with the goal of increasing the number of children and youth in care with access to a mentor. The purpose of the project is to foster meaningful relationships between mentors and vulnerable youth. Three established mentoring organizations, Big Brothers Big Sisters of Calgary and Area, Red Deer Youth and Volunteer Centre Foundation, and Boys & Girls Clubs Big Brothers Big Sisters of Edmonton and Area Society, joined the project by developing and/ or growing mentoring programming for children and youth in care and participating in a program evaluation. The three sites combined report 339 new matches as of March 2016 made during this pilot, supporting children and youth in forming healthy and enduring mentoring relationships with caring adults while receiving intervention services, throughout transitions and post care. To increase the number of mentors for children and youth in care. The Youth in Care and Mentoring Advisory Committee commissioned a literature review on mentoring youth in care in a Canadian context. Literature on programs that focus on mentoring youth in care were sought out, as opposed to programs that serve a range of youth including those in care. Initially academic studies of mentoring youth in care were examined. When unavailable for specific topics, grey literature was referenced. As much of the literature on this topic originates from the United States, interviews were conducted with individuals with expertise in mentoring youth in care in the Canadian context. The academic, grey literature and interview responses were then critically reviewed and summarized according to thematic categories. The Children and Youth in Care and Mentoring Pilot Sites Evaluation is intended to help better understand mentoring children and youth in care, the initial achievements and contributions of the pilot sites, and strengthen this work, with the eventual aim of expanding to be provincial in nature. Overall, the evaluation will help to determine what aspects are working well and why, which are not and why, and offer a regular feedback loop with learning opportunities for pilot sites to make modifications when necessary, learn from each other, and help to guide implementation. This document outlines the Children & Youth in Care and Mentoring Program Design, informed through an extensive literature review, stakeholder consultation, evaluation and evidence-informed practice. This work is relational, collaborative, and significant as mentoring relationships positively impact the lives of children and youth in care in Alberta. This resource is available as a no-fee benefit of your participation in the Alberta Mentoring Partnership and was compiled based on the experiences of prior youth in care mentoring projects across Alberta. Information learned and collected from the Mentoring Youth in Care Literature Review and the pilot sites’ ongoing evaluation was synthesized and expanded upon to develop an online toolkit for organizations wishing to build and enhance mentoring programs for children and youth in care. Subsequently, the Ontario Mentoring Coalition, with funding from the Ontario Ministry of Children and Youth Services, was working to develop a toolkit on mentoring youth facing barriers to success. This provided an opportunity to collaborate and enhance each other’s work to develop a useful resource to support mentoring organizations. The result is an enhanced toolkit delivering information on developing, implementing, evaluating and sustaining mentoring initiatives for youth facing multiple barriers to success, including children and youth in care.